I just saw this post because I was searching how to spell “scaciatta.” I am half Sicilian and grew up in Middletown, CT and grew up with eating delicious scaciatta. I’m now in the Boston area and no one has ever heard of this wonderful treat.. They don’t know what they’re missing!! I have only been able to find it in the Public Market on Main Street. So, I’m very excited to hear that Gotta’s Farm has it! I’ll be ordering that for Christmas. Thanks so much for the info! I’m delighted that you found my post and that it was helpful to you. I am a regular customer at Gotta’s for their fresh produce, and discovered the Scaciatta this past summer. We’ve had it several times and just love it. Merry Christmas. What about Marino’s I loved it when I was a kid!!! OMG we would go there after school. I miss all that stuff not a lot of that in FL miss the fresh bread and Leno’s in Durham!!! Public Market I went to every week I was friends with Johnny’s family and their meets were always so fresh! Ugh makes me home sick, then WINTER comes and all that SNOW! My Aunt Barbara, who now lives in Middlefield, is a Marino from the pizza family. I don’t remember them ever making scaciatta. Maybe because I always went for the thick Sicilian pizza from there. I just discovered (11/16) an amazing Middletown, Ct eatery with scaciatta: Mama’s on Williams Street (about a block from Wesleyan). They delivered a free scaciatta with my friends order and it was amazing! It didn’t look like your pix, but did look (and taste!!!) like something my mixed Italian family living two towns away often made when I was a child (although I cannot for the life of me remember what we called it- I think gramma maybe called it anchovie “pie”?) it looked more like a lumpy square-ish pizza (minus sauce) with all kinds of wonderful stuff crammed into and on top of the dough; tiny pieces of broccoli, sausage, pepperoni, garlic, topped with olive oil, tons of spices and grated parm and/or assagio. Seemed like mom or gramm (even papa) made it with whatever veggie or meat was a leftover in the kitchen! Sometimes dried tomatoes or spinach, meatballs or pork, but whatever was in there, I think a tiny bit of anchovies and a ton of garlic was always the base of that amazing savory flavor! So glad I just found Mama’s, highly recommend from this Roman-Florintine-Siciliano! We used to get ours at Lastrina’s in Middletown! Have NEVEAR found any as good. I’m also going to surprise my husband with Gotta’s!! i loved sebby’s scacciatta (back in the day) and haven’t found another bakery that compares. does anyone out there know the owners of sebby’s or someone who worked there? i’d love to get ahold of the recipe they used and try to create in it my own kitchen. in the meantime, i’m excited to check out gotta’s farm next time i’m in town. thanks for the info and happy new year! Jen, Thanks so much for stopping by. I still have some contacts with people from Middletown. I’ll see what I can find out. Hi Joanne, if you want a recipe, please see the comment below from “Grace” that gives detailed instructions on how she makes it. Thanks so much for stopping by. There is a Sebby that owns Melillis bakery in Portland,ct that makes a amazing scacciatta. Maybe that’s the same Sebby. The same Melillis that used to be in Middletown on Newfield street. Strong possibility for that. Melilli is the village in Sicily where most of the Middletown Sicilians come from (my family included). Hello, Kevin. I love hearing from all of you who know about scacciata first-hand. Thanks for sharing with all of us. My Gram made scaciatta all the time> She would use her wonderful bread dough and add, saugage, mustard greens, potatoes, onions, garlic & green greens. On Fridays she would make it with salmon , potatoes and onions. Nothing was ever better than this amazing meal. She was Floridia, in Sicily..
Southside Market on South Main St in Middletown also makes them as well as Public Market on Main. 🙂 Enjoy! Karen, thank you so much for that information. I have several readers who would like to know where they are sold. I would love to find a place in Middletown that makes these. I was born in Middletown some (haha) years ago, but mom & dad moved to Florida. Some years later I moved back to Middletown, then to Berlin, CT, and lost touch with bakeries. Would love to find a good one that makes great sciaciatta !! Hi Rosalie, how nice to hear from you. One of my readers tells me that scaciatta is available in Middletown at Southside Market on South Main Street, and Public Market on Main Street. Hope this is helpful. Greetings Ted, Thanks so much for your in-put about scaciatta. One of these days I am going to try my hand at making it. I make pizza all the time so it can’t be that much more difficult. I’m Sicilian native and I’m very familiar with SCACCIATA. The correct spelling is with 2 Cs and 1 T. Maybe people from the city of Boston don’t know about scacciata, but people from cities around Boston know about scacciata. I lived there for 7 years and then in NH for 35 years. I moved back to Sicily 4 years ago and just got back in the States. Today the Sicilian make scacciata the same way my mother made and I make. 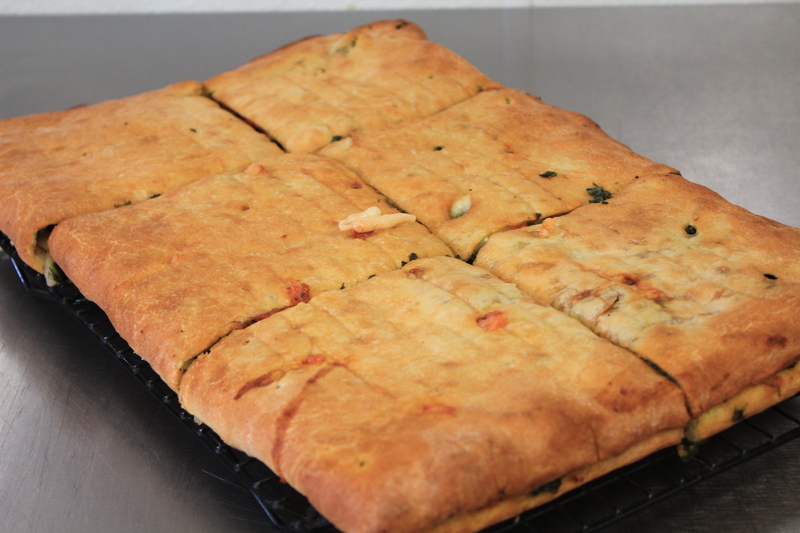 The scacciata is very simple to make, but not inexpensive if you use the good ingredients. Place dough preferably on a rectangular cookie sheet sprinkle with little flour. The first layer is very thin slices of potatoes; 2nd layers is one of these raw vegetables only (broccoli, cauliflower or spinach; your preference; traditional is broccoli or cawliflower); 3rd layer is about ¾ lb to 1 lb of high quality sausage meat seasoned; the 4th layer is about ¼ lb of diced pancetta; the 5th layer is ½ lb diced parmigiano cheese. In Sicily they also use pecorino primo sale or “tuma” (a young pecorino cheese without salt that must be consumed within few weeks; it’s very hard to find in the USA); the 6th layer is on small diced onion; the 7th layer is few spoons of passata or two medium chopped tomatoes all over (it’s very little sauce for some taste and color); salt and pepper (if you like it piccante, don’t be afraid to add peperoncino). For last drizzle some EVOO. Cover it with the rest of the dough. Make about 4 slashes and bake at 350 for 45 to 60 minutes. Take it out of the oven and cover with a clean dish towel and let the scacciata sit for about 20 minutes before serving; it tastes just as good even warm. I hope the word layer does not scare you. I use the word layer instead of “then add …”. One thing that you could add is few black cured black olives before the onions, not too many. By the way, I made it tonight and it was delicious! D&S on South Main made the best! Will definitely be checking out Gottas! Thanks for stopping by, Bill, and for your input on the subject. I, too, grew up in Middletown and am of Sicilian decent. I miss so many traditional foods, but most of them can be found elsewhere …NOT scicciata!!! Another place that makes a good one is Patty Cakes bakery on Cromwell Ave., in Rocky Hill. Both Patty Cakes and Melilli’s in Portland require you to order ahead of time. I always try to make sure that I order one when I head back to visit family. I highly recommend both! Greetings Michael, so very nice to hear from you! Great news about Patty Cakes, thanks for the info. Also I didn’t know that ordering ahead is a requirement. Writing this little blog has put me in touch with so many wonderful people, thanks for stopping by and for your in-put. Still available at Tommy’s Pizza, Lino’s in Durham, Illiano’s, & Mazzotta’s bakery, Yum. Jerry’s pizza on South Main makes an amazing scacciata. when reading this article it brought me right back to my roots when Saturday my grandmother would make several kinds. Brocolli, potato and sausage, spinach, or a combo of the left over ingredients. I today still make it however when notin the mood to cook I call Jerry’s and they do an amazing job I remember Lastrina’s pizza and also Marino’s and I believe they all helped us enjoy many types of foods that our Italian heritage is all about. The last hold out Itlian restaurant was Theresa’s in the North End however Age took over and that closed as well. The only one comes near their pie is Carmela at Jerry’s. Mama’s Italian Market on Williams St. In Middletown has scaciatta, pretty good too! D&S Pizza…later Sebby’s Pizza on South Main St. in Middletown CT made Scaciatta just like my father Giuseppe did. Our cousin Sebby also made great Cudduruni with anchovies but if you try to get either in a pizza shop or a “Ristorante” in Florida…it’s not happening. I get the look from the owners like a third eye just appeared on my forehead. Scaciatta, a slice of pure comfort food, from Melilli, Sicily to Middletown, CT. Will have to try some of the restaurants mentioned next time I’m in CT.
Hi Al, thanks so much for stopping by. This post on scaciatta has generated more interest than anything else I’ve written. Thanks so much for joining in the discussion. I’m of Sicilian descent and I grew up on these. My mother made them all the time, although the word she used was Scaccia. I’m suddenly craving one. She made several types. One common one used potatoes and onions as the filling. 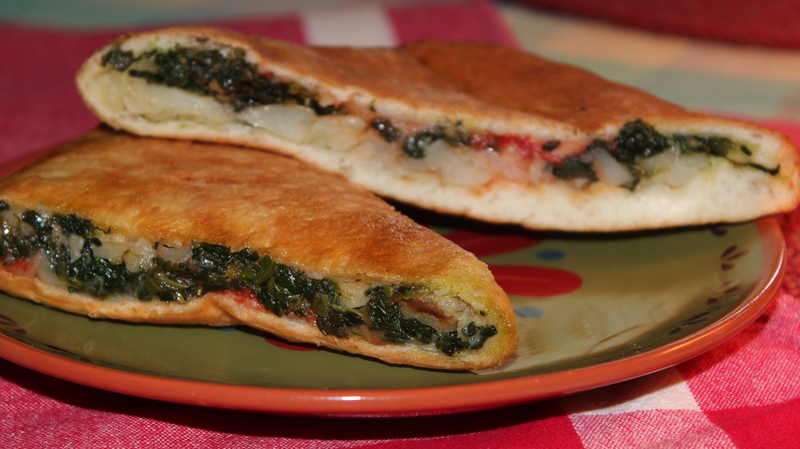 My great grandmother used to make this as well and she also called it Scaccia. She spoke broken english only so I remember as a kid pronouncing it as scotches. She always made 2 versions, 1 with ricotta and sliced sausage, the other with carmelized onions and tomatoe sauce. We are Sicilian as well but hailed from North Jersey (Hackensack). She also used to make a lamb pie with peas on Easter. Mmmmmm.